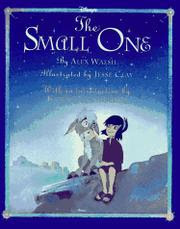 Does anyone remember the Disney classic Small One? This was one of my f-a-v-o-r-i-t-e Christmas cartoons growing up. It's been so very long since I've seen it. I was in Goodwill the other day when I found this hardback copy of the book for $0.99. Let's just say that I didn't hesitate to throw it in the cart! If you are unfamiliar with this book, it is the story of a little boy and a very special donkey that is so old, small and weak that he's useless as a work animal to the boy's father. The father decides that the donkey must be sold because even once piece of silver would be better than continuing to keep and feed the donkey. Our heartbroken young boy decides that he would rather be the one to take Small One to town and find a new owner for him, rather than having his dad do the dirty work for him. The boy takes Small One to town but doesn't find a suitable new owner for him. Instead he runs an assortment of characters who are less than stellar, as well as a tanner who only wants the donkey for his hide. The movie short has the boy comforting the donkey, singing encouragement about finding a friendly face who is gentle and true, someone who is very special. Lo and behold a new owner does come for Small One. The new owner needs a donkey who can carry his wife, Mary, to Bethlehem. Yes, it's a Christmas story. And yes, we're getting ready for Easter. You might think this mention/review untimely except that you must admit that we couldn't celebrate Easter without a Christmas! Besides, I can't help my timing in finding this book (again). For your enjoyment and entertainment, I've looked up the Youtube videos. You can also purchase a Disney DVD which has Small One along with some other Disney Classic Holiday Stories (It also has Mickey's Christmas Carol on it! Woo hoo!). I've ordered a copy because I want to make sure we have it on hand this coming Christmas season. Oh wow! You've brought back a wonderful reminder. We used to watch this on TV every Easter and I just loved it. Haven't seen it on TV in years, too bad all they show anymore is Easter Bunny stuff. I'm not too big of a Disney fan but I am a fan of the old stuff that Walt actually was a part of. I'll have to check out what all is on that DVD. I love that book! I read it to my children. I didn't know there was a movie of it! I enjoyed watching this again last Christmas! Great recommendation.